Call it marketing gimmick or the pick at opportunity, Hong Kong's mask makers are having a blast. With Swine Flu outbreak and a global alert being declared its time to protect yourself. Designer masks are in. 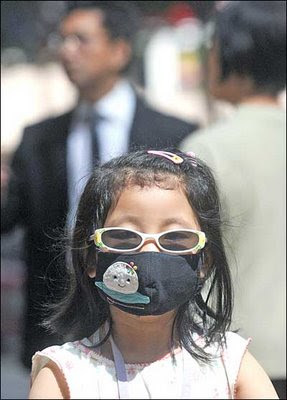 This young girl sports a cool look with her shades and mask. Fools look for opportunities, wise create them.